LipoRush is “a super concentrated extreme thermogenic formula fueled for maximum daily energy levels and a spark for thermogenesis”, it sounds complicated but this product is made for those who have the desire to burn extra fat and reach their desired body shape. This supplement works using thermogenic ingredients to heat up the body and burn the fat, it also increases the levels of energy, speeds up the synthesis of amino acids which is required for muscle growth. 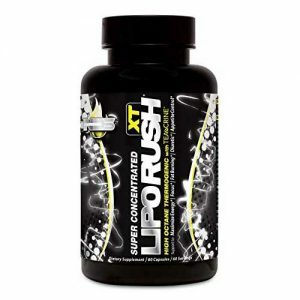 In brief, LipoRush stimulates the metabolic activity of the body and as a consequence, it gets so much easier to lose fat. LipoRush is manufactured and distributed by NDS, this last one is a supplement line from FitLife Brands, Inc., a company based in Nebraska. NDS provides products designed for your health and well-being, especially focused on calorie burning, body toning, and weight maintenance. The NDS team is composed of business and marketing executives who are passionate about health and nutrition that try every day to innovate their products to provide you the best. Their products include energy supplements to general health supplements, being LipoRush one of the most famous of the weight-loss line. For advice and additional information about this supplement or helpful tips, you can contact the manufacturing company directly at the following phone number: 1-866-820-5559. Ingredients: Caffeine Anhydrous, Theacrine, Cayenne Fruit Powder(Capsicum annum), Amla(Phyllanthus emblica)(Fruit) Ext., Theobromine(from Cocoa Beans), Quercetin, Yohimbe Bark Ext. (Pausinystalia yohimbe), Taraxacum officinale(Dandelion Root) Ext., L-Carnitine, Blackberry Ext. (Berry), Uva Ursi Leaf Powder(Arctostaphylos pincuica), Commiphora mukul Gugulipid Ext., Rhodiola rosea(Root), Extract, Ashwagandha Extract(Root), Withania somnifera, Licorice(root) Glycyrrhiza glabra, Holy Basil Leaf(Ocimum sanctum), Schizandra Fruit(Schisandra chinensis), Kelp(Laminaria digitata), Magnolia officinalis Bark, Huperzine A(Toothed Clubmoss), Glutamine, Leucine, Isoleucine,Valine, and Black Pepper(Piper nigrum) Fruit Extract. Other ingredients: Gelatin (Bovine), Vegetable Magnesium Stearate, Rice Flour, Silica, FD&C Blue 1, FD&C Red 40, FD&C Yellow # 5, FD&C Yellow # 6, and Titanium Dioxide. The way LipoRush burns fat is due to its blend, it contains Caffeine Anhydrous, which acts as an energy booster and fat burner; amla fruit extract, which helps lower cholesterol levels and reduces the fatty acids; beta-phenylethylamine HCL; an energy booster. The benefits that the manufacturer claims are: activated thermogenesis, an essential process to lose weight, and it is enhanced by regular exercise and a balanced diet; LipoRush can boost your energy, it has a positive impact on your daily life promoting your confidence levels and productivity; and it also increases concentration, so you will feel more focused and less tired even after an exhausting workout. This product considers a very important point when it comes to supplements, we are talking about bioavailability, sometimes the body does not absorb all the nutrients, in this case, all the active components of LipoRush but this product is made to be available after intake to obtain the desired results. In this case, what the company claims is true; even though it only has 3.8 out of 5 stars on Amazon, comments are good. The people who tried this product affirm that the first noticeable result is that they have more energy but at a manageable level, people started losing weight after two weeks of consuming this product and they also notice that the appetite is under control. How Much Does Liporush Cost? Liporush is very affordable compared to other similar nutritional supplements. The LipoRush label states that only people over 18 years old can take this supplement, it contains diuretics which may increase urination so it is important to drink enough water while taking it to prevent dehydration. Some side effects may be severe headaches, mood swings, insomnia, nausea, and anxiety. LipoRush can be consumed by anyone who is healthy and does not have a cardiac-disease background. It is important to mention that some ingredients of this supplement are banned by sports organizations so professional athletes can’t consume it. Liporush can be ordered online from different places but our recommendation is to either buy it directly from the manufacturer or purchase it from trusted online retailers which may offer you discounts. We did a research on other products from NDS Nutrition. Here is a complete list.